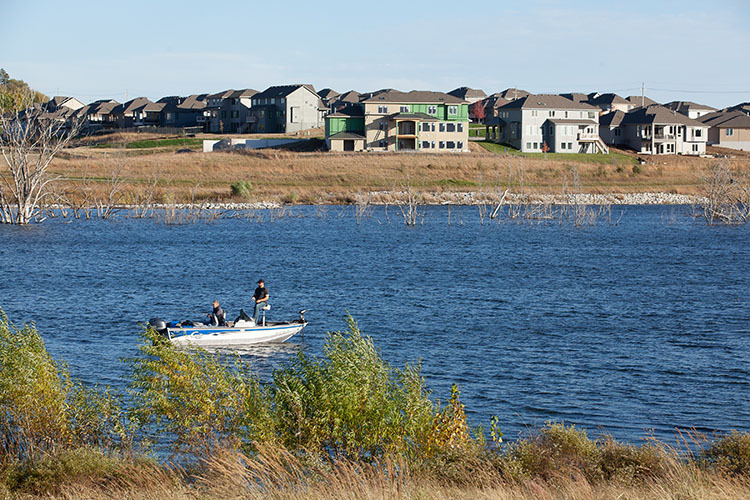 Sarpy County for years was known as a bedroom community, an escape from the hustle and bustle of the city. Recently, it’s become a destination for companies seeking available land, access to major roadways and a steady supply of potential employees. Facebook is one such company. The social network in April 2017 announced it was going to build a facility near Highway 50 and Capehart Road. Less than a year later, the company said the project would consist of six buildings instead of two. While the announcement was news to everybody from Council Bluffs to Lincoln, officials from the county, nearby cities and several other agencies laid a lot of figurative groundwork long before any literal groundwork began. The company is the latest to move to the area, which is teeming with activity. Several multinationals, including Traveler’s Insurance, Yahoo and Fidelity Investments, now have facilities in what was partially rural farmland until a few years ago. While an expanding population, low cost of living and ample available space were all part of the attraction for the companies, so was a readily available power grid to service the data centers, which take a lot of electricity to operate. “That’s definitely part of the pitch” to companies considering the area, said Andrew Rainbolt, the executive director of the SCEDC. “OPPD originally built a substation when the Traveler’s data center was announced (in 2013) and since then it’s been a keystone for growth along the Highway 50 corridor. They kind of opened a whole new market for us as far as growing our industrial capacity. Facebook said through a spokesperson that when considering where it would put its new data center, it was not only looking for clean and renewable energy solutions, but also a “robust” electric grid. The Papillion Data Center will be supported with 100 percent renewable energy. 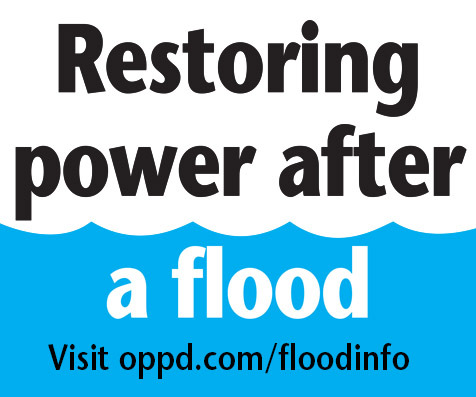 OPPD’s Rate 261M, a unique way for large-power, high voltage-transmission-level customers to meet their renewable energy needs, also played a key role. The substation in Sarpy County will serve a new Facebook data center as well as future development in the area. After Facebook’s announcement, an existing substation built in 2014 was upgraded to handle the power requirements of the data center along with the planned Sarpy County Transmission Project and continued growth in the county. It was also revamped to accommodate future growth in the immediate area. O’Brien said a collaborative effort was launched several years ago to attract such companies. Officials from the county, OPPD, the SCEDC, the Nebraska Department of Economic Development and the cities of Bellevue, Papillion, La Vista, Gretna and Springfield all worked together to find a way to make Sarpy County a destination for large companies. 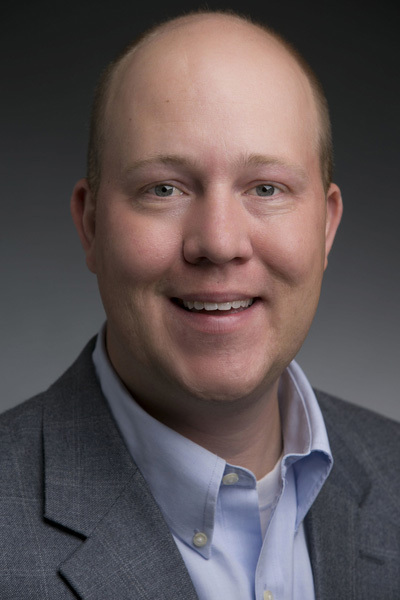 Dan Lenihan, director of Planning and Strategy for OPPD, said the first step in making the area friendly to data centers and other area growth was to expand existing power substations and lay many miles of new electrical distribution lines along the Highway 370 corridor. The utility then built two substations in the area to support future growth, some of which are in areas where the data centers have been built, he said. 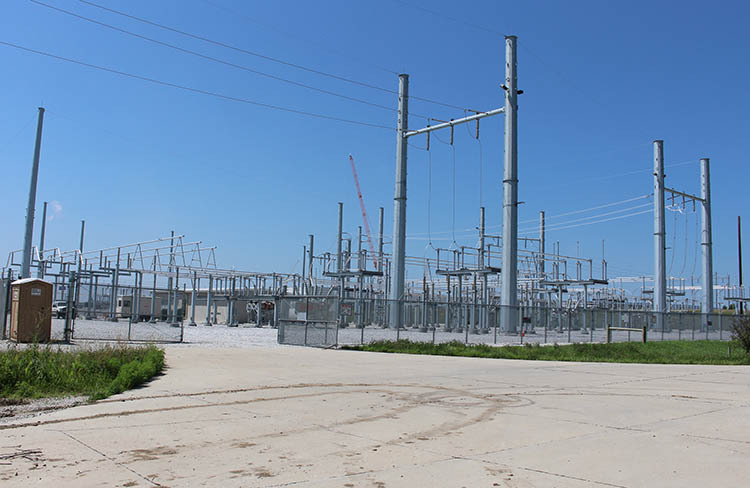 OPPD has recently expanded existing substations for “very large” data center growth and is in the process of expanding it high-voltage transmission grid in the area led by a new high-voltage transmission line along Highway 50 called the Sarpy Transmission Project. David Black, the mayor of Papillion, said that kind of foresight helped land the data centers. But building new power substations and placing power lines, along with adding sewers and streets, can’t be done without some economic risk. Build too soon and the investment could languish undeveloped. Wait too long and companies that want to move quickly will look in areas where infrastructure is already in place, he said. “It’s the chicken and the egg – you don’t want to build too early, but you don’t want to wait until someone wants to make a deal,” he said. At least one company is taking a leap of faith in Sarpy County, Black said. R&R Realty, a Des Moines-based firm, recently cut the ribbon on its new 250,000 speculative warehouse near Highway 50 and Gold Coast Road, the first of four buildings it’s constructing. What makes R&R’s development unique is that it doesn’t yet have a tenant, and building purely on spec is something uncommon in the Omaha metro area. The company said in an October statement that demand for warehouse space with, among other things, accessibility to major roadways was one reason it chose to build in Sarpy County. Its proximity to interstates 80 and 29 and highways 50 and 370 makes the area attractive to companies that need quick access to well-used thoroughfares. Being the midpoint between Omaha and Lincoln also has its advantages, Black said. It’s not surprising, then, that Sarpy County’s population has exploded in the past two decades. Since 2000, it has jumped 47 percent to more than 180,000 last year, according to the U.S. Census Bureau. A study by the Omaha-based Metropolitan Area Planning Agency shows Papillion alone will grow to between 70,000 to 90,000 people by 2050, Black said. To accommodate the growth in population, Papillion, Gretna and Springfield have all been developing new housing plats. Papillion alone has 1,500 lots in inventory where future residents – potentially employees of companies that move into the county – will live, Black said. The county as a whole has about 5,000 plats set aside for homes, said Karen Gibler, the president of the Sarpy County Chamber of Commerce. OPPD’s upgraded and new substations have helped housing development keep up with economic development, she said. “Instead of playing catchup, they say `we can continue to help this healthy, sustainable growth by thinking ahead,’” Gibler said. Gretna has led the population boom. The city’s population has more than doubled from 2007 to 2017 to 4,905, according to the state of Nebraska. LaVista’s population rose 42 percent to 16,638, while Bellevue’s was up 11 percent in the past decade to 51,159, making it the largest city in the county. Papillion’s population was up 10 percent to 20,083 and Springfield gained 5.4 percent to 1,529 residents. 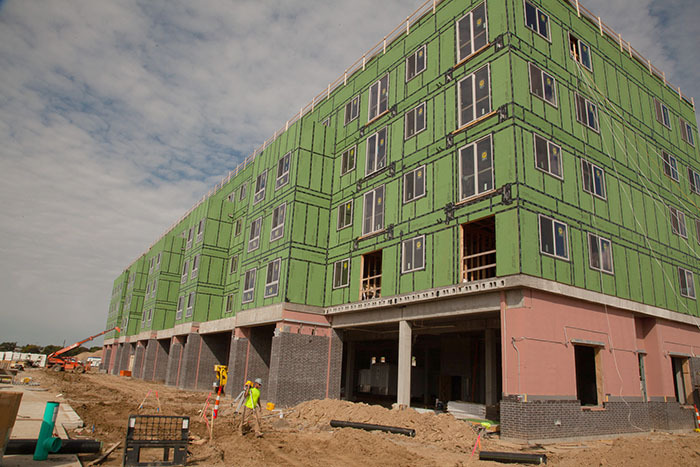 Sarpy County’s renaissance hasn’t happened overnight. What was formerly a bedroom community where workers from Omaha and, to a lesser-extent, Lincoln rested their heads, the area has become a destination for large companies. While it may seem new, the current expansion in Sarpy County has been going on for the better part of two decades. Claas, the heavy equipment manufacturer, opened its facility near the intersection of 132nd Street and Giles Road – close to Interstate 80 – in the 1990s, Rainbolt said. Oriental Trading Company also opened a facility in that area at about that time. PayPal unofficially kicked off the area’s high-tech boom when it opened its customer service center in Sarpy County in 2003. The company is now the county’s second-largest employer behind only Offutt Air Force Base, according to census data from 2014. In 2008, Yahoo said it would put its new data center in the area, and moved several key positions to Omaha offices. Fidelity, Traveler’s, Oxbow and Facebook followed. The addition in the late 1990s of a major intersection near 126th and Harrison streets opened the area to better interstate access, which made Sarpy County more attractive. I-80 interchanges have since been built in the county, drawing large companies that need or want to be near a major national thoroughfare, Rainbolt said. Despite the increase in population, access to an educated, well-trained workforce is a challenge for the region. Data centers tend to need minimal staffing. Attracting talent, while extremely important, isn’t as tough as if, say, Amazon’s HQ2 were to build in the area. Still, the Omaha metro area has one of the lowest jobless rates in the country. This means selecting qualified workers from the area’s thin employment pool isn’t easy for any company. The unemployment rate in Omaha in August 2018 was 2.7 percent. It has been hovering on either side of 3 percent for the better part of four years, according to the U.S. Bureau of Labor Statistics. Nationally, the unemployment rate in August fell to 3.7 percent, the lowest since 1969, BLS data show. Sarpy County has been growing at breakneck speed recently and community leaders say there’s no slowdown in sight. The Sarpy County and Sarpy Cities Wastewater Agency was formed in September 2017 by the county and the cities of Bellevue, Gretna, La Vista, Papillion and Springfield. Their aim is to build the Unified Southern Sarpy Wastewater System, a sanitary sewer system to serve the southern portion of Sarpy County. That will open previously undeveloped areas, pushing growth south. Existing areas are also seeing development. Landlocked La Vista is developing an area along 84th Street that formerly housed a Walmart and several smaller stores. Developers and the city closed on the area, called Brentwood Crossing at the time, and will turn it into the La Vista City Centre composed of retail, dining and entertainment space. Downtown Bellevue is also seeing redevelopment, as are parts of Offutt Air Force Base, Springfield and Gretna. “As the metro keeps expanding south, we’re seeing a continual transition from rural to suburban and suburban to urban,” said Mike Herzog, the manager of distribution planning for OPPD. “Each stage of development has its own needs and limitations so we’re constantly adjusting the system to meet the latest changes.